Scheduled for release this week is Watch Dogs, Ubisoft’s heavily promoted open world techno thriller. As is often the case with these high profile AAA games, NVIDIA and AMD's GPU driver teams have been hard at work putting together their launch drivers for this game, which means this week should be a busy week for driver releases. The first party out of the gate is NVIDIA, who today is releasing their 337.88 WHQL “game ready” driver. The bulk of NVIDIA’s emphasis with this driver is of course on Watch Dogs compatibility and performance, especially since NVIDIA has been including it as a bundled game since late last month. Along with the bundle Watch Dogs is also NVIDIA’s latest technology showcase title – implementing a few enhancements from NVIDIA’s GameWorks libraries including TXAA anti-aliasing and HBAO+ – so the company is eager to back their latest showcase, even going so far as to publish an extensive Watch Dogs performance and tweaking guide over on their GeForce.com portal. Watch Dogs aside, NVIDIA has also worked in a few smaller additions with 337.88 that should be of interest to GeForce owners. As the first WHQL drivers from the R337 branch, these are the first WHQL drivers to incorporate all of the performance improvements we first saw last month with 337.50, with a significant focus on cutting down on CPU overhead. NVIDIA notes that they’ve worked in some further performance optimizations since then, though they do not specify what those optimizations are or how they are different from what they already did with 337.50. If nothing else it looks like NVIDIA has updated a number of game profiles for SLI, adding or tweaking support for multi-GPU configurations. Meanwhile we finally have an official description for the shader cache feature first introduced in the 337.50 drivers. At the time NVIDIA was not talking about the feature, but they have now published a more through explanation, stating that the shader cache setting is designed “to reduce CPU usage by saving compiled shaders to a disk cache. This may improve performance and reduce the time it takes for a game to load.” This setting is enabled by default. Finally, GeForce owners will be happy to hear that NVIDIA is addressing a number of display issues with 337.88. 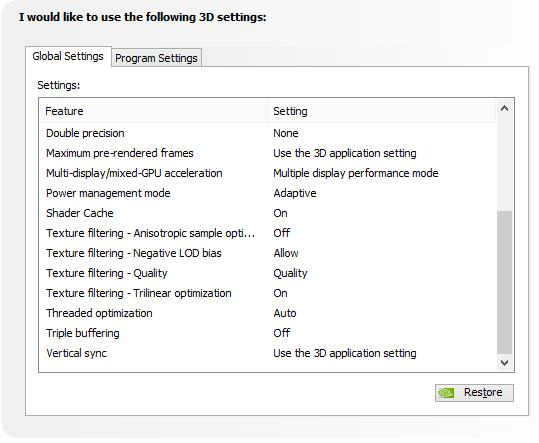 Single-tile (SST) 4K displays such as the Samsung U28D590D are now fully supported in NVIDIA’s drivers; previously only multi-tile (MST) displays were supported, whereas in the long run multi-tile displays will eventually give way entirely to single-tile displays now that the necessary controllers are now available. NVIDIA has also fixed a number of surround issues, including surround problems on GTX Titan Black and 3/4-way GTX 780 Ti configurations. As usual, you can grab the drivers for all current desktop and mobile NVIDIA GPUs over at NVIDIA’s driver download page. I don't know about your setup, but in case of mine, C2D E6550, GTX 560 Ti, assassin's creed IV went from unplayable even on lowest settings to acceptably playable; from 16-17 FPS to 24-30.